Distribution - Common in coastal and offshore waters from the Capricorn Group in north Queensland around the coast of southern Australia to Coral Bay in Western Australia (including Tasmania). Snapper are found around the southern coastline of Australia. Juveniles mainly inhabit inlets, bays and other shallow, sheltered sea waters. Adults are found near reefs, inshore and offshore and in water depths of between 1 - 200 metres. Snapper mature at approximately 4 years and can live up to 35 years. Size - Maximum of 20kg and a length of over 1m. Characteristics - Bright blue spots on body that become less distinct with age, and a background colour of pinkish silver to red. Large fish may have a large bony hump on the head and a fleshy bulge on the snout. Snapper are a popular angling species and are regarded as an excellent table fish. Common names include: cockney bream, reddies and squire, which are the names of juvenile snapper during different stages of their lifecycle. Snapper are found around the southern coastline of Australia. Juveniles mainly inhabit inlets, bays and other shallow, sheltered sea waters. Adults are found near reefs, inshore and offshore and in water depths of between 1 - 200 metres. Snapper mature at approximately 4 years and can live up to 35 years. Recreational Snapper catches are usually by rod-and-reel and handline methods, using pilchards as bait. Squid and octopus are also a popular bait. Minimum legal size in all states with bag limits in force in New South Wales, South Australia and Western Australia. Snapper are structure dwellers, they feed over particular areas of reef, gravel or broken bottom and to catch them consistently, offshore anglers must know some of these places. Snapper can be found over a range of habitats although most of these locations have a hard bottom. Snapper comes in many sizes, making it very versatile. It is excellent as a buffet piece, whole, filleted or as cutlets. Snapper is superb smoked and is also becoming popular for sashimi. The heads and frames of snapper are sought after as they are excellent for use in finfish stews and stocks due to their colour and sweetness of flesh. 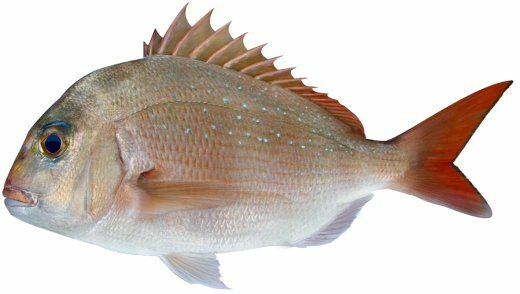 A tender, white to pinkish flesh and a sweet and mild flavour make snapper a popular and versatile finfish, suited to poaching, steaming, frying, baking, grilling, barbecuing, smoking or sashimi. Snapper are a prized table fish and excellent sport fish. They are an important fishery for both commercial and recreational fishermen. They are caught using lines, traps or nets. Caught year round, with peak supply in the winter months. Farmed snapper should soon be available year round. Buyers and Sellers of Pagrus Snapper are listed.